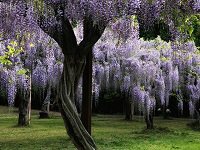 The town of Biei is located almost at the center of Hokkaido, in the hilly district at the foot of the Tokachi-dake Mountain Range, Daisetsu-zan National Park. In contrast to the flat plains of rice fields and steep mountain ranges that cover much of Japan, Biei is surrounding by rolling fields, perhaps more reminiscent of western Europe than northern Japan. 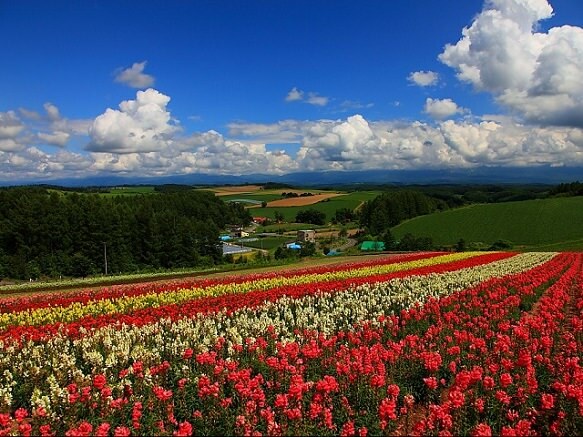 In recent years the fields around Biei have been used in countless advertisements; keep your eyes on the billboards and big-screen TVs in Tokyo and other large cities, you may see a little bit of Biei before you visit Hokkaido. 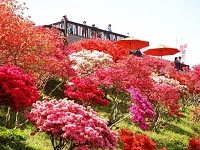 The attractiveness of Biei, where as many as 1.2 million people visit every year, is represented by its spectacular views of flowers.You will be astonished by the magnificent views of colorful flowers such as lavenders, sunflowers, poppies, cosmoses, and purple salvias, blooming just like beautiful patchworks. 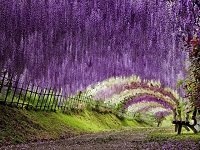 You can walk through these flowers at some locations. If you like outdoor activities, you will love all nature has to offer in Biei. In summer, you can stroll in wild woods, climb trees, walk along the river, go canoeing or camping, or play golf. In winter, the town is transformed by snow, whose magnificent appearance will astonish you as you ride on a snow buggy or snowmobile. 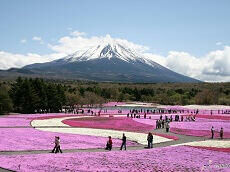 Enjoy the beautiful flower fields by arranging your own private/custom Japan tour.